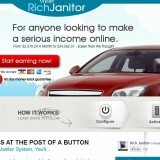 “The Rich Janitor”, by Mike Dougherty (now Mike Dee on the site) and found at richjanitor.com, is a Pay Per Click traffic generating system with several issues of which to be to be wary. To start, The Rich Janitor uses the inconsequential “urgent call to action” ploy that most scammers use. With a ticking clock and huge bright fonts, they try to compel you to act fast and join before the discount offer runs out. With this tactic, The Rich Janitor also does the “only a few positions left” trick to make you think this could be a job and that is way far from the truth. The Rich Janitor claims you can make at least $200 per day working only about 5 hours a day with no skills or internet marketing experience. However, soon after joining and paying their $47 dollar fee, The Rich Janitor quickly offers you more and higher cost up-sells with promises of bigger commissions, yacht parties with millionaires and luxury hotel stays… blah blah blah. The Rich Janitor would have you pay $97 to upgrade to the first ups-ell then about $200 for the next then almost $500 to join their big package. If you fall for it all they are then into you for about $850. Then they have you pay more for your leads, which are actually duplicates of what you already bought. The Rich Janitor tells you to contact those leads and give them the same spiel they threw at you to lure you in. It goes on in perpetuity until your own reputation is ruined as a scammer just like them. What it amounts to is a pyramid styled scheme that doesn’t even really focus on the poorly put together product they’re hocking. That product is really just outdated article writing software and an even more out of date article submitter bot program that Google frowns upon now and will ding any SEO work that you do. The Rich Janitor is a completely worthless system that only makes Mike Dee and his band of swindlers the only real money to be made. You cannot expect to go very far with worn out cold leads and bad, unusable software. The article spinner spits out unreadable nonsense which the search algorithms also dislike and will be penalized. The Rich Janitor methods may get you banned, so be careful not to purchase this system if you do not know what you are doing. It is definitely not newcomer friendly. Tired The Rich Janitor tactics like promo banners, links and prefab landing sites are now avoided by everyone who is wise to the scheme so responses to almost anything you do will be small and of little use to you. The actual The Rich Janitor site access is in complete disorder with no sense of where to go with out of place eBooks and videos in no particular categories or organized sections. Also, if you manage to make sense of any of The Rich Janitor jumble, you will be promoting the very same thing everybody else would be promoting, too. After much digging, I found that The Rich Janitor site is registered to an Ankur Patel, not Mike Dee or Dougherty or whatever fake name they will post next month. The alleged secret of massive internet wealth worked well enough for Patel, but not for anyone at the bottom of the barrel because it is pretty much played out. The phony story of a janitor who found this “secret” coincides with another scam business opportunity called, suspiciously enough, The Rich Dishwasher, which uses a different fake name for its story. Both use the same hosting, the same story slightly altered and the same shill comments from fictional customer testimonials. It is highly likely you came to this article looking for the truth after seeing at least one or two over-hyped email ads touting the praises of The Rich Janitor. I can tell you it is a Clickbank product, so you can get a refund from them because getting one directly from The Rich Janitor has been reported to be difficult at best. That alone saves them from us calling them a scam… barely. We cannot in good conscience recommend The Rich Janitor to anyone looking for ways to legitimately make money from home through online income marketing. Thank you for your detailed assessment. I earn my living by writing online, so I’m always interested in observing how these scams work, since I get paid real money through my clients on Upwork (so far, in excess of $100,000 over a few years – which is fine, since I retired to the Philippines). This particular scam’s introduction is (unfortunately) “brilliant” and hits all of the “right” buttons. If you ever want an example of pure evil, then you’d have to really search many different “business opportunities” online for a useless pyramid scam like this, which is “explained” through an introduction audio so cleverly. Thanks, again. I thought I had heard the hype before and that is why I checked the scam list and there was The Rich Janitor in all his tarnished glory! Thus warned I didn’t respond further to his enticements and promises of becoming a millionaire within a year. He claims that the money is going to increasing the security and the encryption of his “software”. Perhaps the software is in the brains of the people who swallow this trash. Leave it strictly alone . I’m highly embarrassed that I got sucked into this ‘scam!’ I can paint a down and out picture just like this Patel character but unfortunately for me mine is so vividly true! Admittedly, I was very desperate at the time I forked out my hard earned money to invest in this ‘scheme! Luckily enough I was only hit at the lower end of the money scale but it still hurts as all the bills keep rolling in! In fact, I’m on that many payment plans to supposedly ‘catch up’ that it’s an ongoing struggle to ‘rob Paula to pay Peter! And just to add insult to injury, even though you claim that they are ‘affiliated with Clickbank’ they have informed me that ‘ it appears that this transaction was not charged by ClickBank, but by The Rich Janitor directly. If the transaction was related to a purchase made through ClickBank, the charge would be identified on your payment records as “ClickBank” or “CLKBANK*COM”. Unfortunately, since ClickBank was not involved in the purchase, you will need to contact the appropriate merchant for assistance with your request.’ We’ll what fun that has been! I emailed ‘Mike Dee’ supposedly directly and instead of refunding me the entire amount of approx $150 I received a lousy approx $6 including the International Exchange Fee! Now I find myself approx $140 out of pocket and with Clickbank’s revelation up sh*!t creek without a paddle! And to add insult to injury Suprise! Suprise! Since refunding the $6 odd (after all but promising me a full refund) and shooting back not 1 but 2 emails to retrieve the balance of the money owing to me the lines of communication have ceased except for the repetitive bullsh*!t generic emails! Seriously the old adage stands-the Rich keep getting richer and the poor getting poorer because even though we are down and out we keep fighting and believing in the greater good in people! And that is why we may be financially deficient but not morally!